Semion Mikhailovitch / Михаил Семёнович (1778-1835) was the the son of Mikhail Semionovitch / Михаила Семёновича and Agafia Stepanovna (née Lashkevitch) / Агафья Степановна Лашкевич. During the time that Prince Alexander Borisovich Kurakin was Governor General of Malorussia (little Russia), the appointed Marshal of the Nobility of Poltava Province in 1803 was Semion Mikhailovitch who was also concurrently the marshal of the Nobility for the Poltava region. He reached the rank of State counselor /действительный статский советник, and was both a wealthy landlord, benefactor and nephew of both Count Victor Pavlovich who was Minister of Interior Affairs and by marriage his mother Ulyana Andreivna (née Bezborodko) / Ульяна Андреевна Безбородько (1742-1776). In addition, his grandmother, Xenia Gerasimova (née Demeshko) /Ксения Герасимовна Демешко (-Стрешенцова) was the first cousin of Empress Elizabeth’s lover Count Alexei Grigoriovitch Razumovsky / Алексей Григорьевич Разумовский (1709 -1771) and of course the last Hetman of the Ukraine, Count Kirill Razoumovsky. Among Semion’s many charitable gestures for which he is remembered today is the donation of his brickworks factory to the Order of Public Welfare / Приказ общественного призрения for the construction boom in the city at the turn of the 19th century. He donated funds to the building of the Governor and Vice Governor’s residences which is pictured above. Work on the General-Governor House was begun in 1803 under the plans of architect A. Zakharov, and the building was completed in 1811. In addition Semion donated 18,000 rubles for the purchase of a house that would be home to students from poor households. His garden was dontated to the city and an adjecent plot was purchased by Prince Alexander Kurakin to create what is today known as Victory Park. 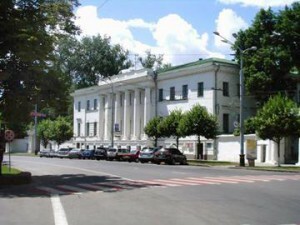 When in 1808 the Institute of Young Ladies was opened in Poltava he donated his mineral collection (a passion that his distant nephew, Piotr Arkadievitch (1825-1892) would carry on with his own collection). In turn Semion paid the fees for eight pupils of the gymnasium. He held his post as Marshal of the Nobility of Poltava until 1805. Survived by his son Nikolai, Semion died penniless having given away his families vast fortune but ultimately hurt by poor management of his remaining assets. Simeon died in Beliki (Mirgorod district).